Looking for a professional floor sander to sand and polish your timber floors? You’ve come to the right place. 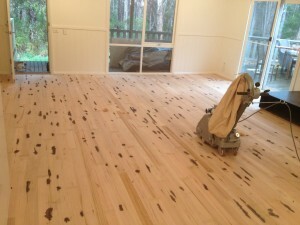 The guys and I have over 20 years experience with refinishing timber floors. Whether it be old timber floors, modern flooring, or the timber deck outside, we can do it all. We also specialise in the eco-friendly finishes for those that are happy to pay a bit extra to help the environment. We can do just about any colour tint for the floor polish, and we work with just about every type of timber. You can be sure that with 20 years in the Melbourne floor sanding business, we’ve got a lot of experience under our belts. We worked out that we have done over 5000 floors now. That is a lot of work! During those many years, we have come across every imaginable problem and learned how to deal with them effectively. Ask us anything about timber flooring and we will be happy to help out with advising you in any way we can. Paraquet flooring is no problem for us either – any type of floor can be sanded and polished. We have a long list of satisfied customers, and I know you’ll love our services as well. We hope to display some of our many referrals here on our website, but until now we have just been so busy! We focus on getting high-quality work done, rather than hassling our customers for floor sanding reviews! If you haven’t heard of us before, it is because we do a lot of contract work for builders and showrooms. You know – the places where presentation has to be top-notch! Tradesman and retailers use us because we are affordable and provide exceptional results at affordable prices. We offer the same great service to you! In fact, if you are in a home with timber flooring, we may have sanded them when they were first installed! Some timber floors will last for many years before they need redoing – but it all depends on the level of traffic, wear and tear. Also, if you have pets or children, the floors can wear a bit faster than normal. Regardless of the reason, you can be sure that the polish we use is top-notch. We only use the best brands and apply them with expert precision. But obviously you are aware that getting your timber floors sanded and polished is going to cost a bit, so here is a guide that will help you in making the decision which is best for you. What we charge depends on what needs doing. Our prices can be as low as just $28m2. However, if you want a particular type of finish or an eco-friendly water-based coating, it will cost more. The floor will be good for many years to come, so the cost per week over 10 years is very low. If you break it down, a room which is 35m2 at $28m2 will cost $980 + GST to get refinished. Over 10 years works out to about $2 week! And many people only get their floors done once or twice in their lifetime. Of course we don’t offer a weekly payment program – but you can see the point we’re making. You could also reason that getting your timber flooring sorted will add value to your home, not to mention making it feel cleaner. Not sure what colour is going to look good on your floors? No worries – we do free colour samples upon request. Just fill out the sample request form and we will do one up for you and drop it off to your door. It costs us time and money to do this, but we do it for free – just another way of showing our great service and commitment to your satisfaction. So if you’re looking for floor sanding in Melbourne, please give me a call. My name’s ‘Charlie’ by the way. Hey, even if you just want some advice about your floor restoration job or need a colour sample, give me a call or drop me an email. I’d be happy to help out. Copyright © Affinity Floor Sanding | Affinity Floors 2018. All Rights Reserved.